This is a variation on the Savagnin rose quoted by the botanist Bock in 1551 in his Kreuterbuch. The genius of Alsatian grape growers knows no bounds, and the countless categories of Savignon result in a muskier variety after the war of 1570, the aromatic rose pleasure. The best quality is only obtained in the hills below the Vosges, where the climate is right. 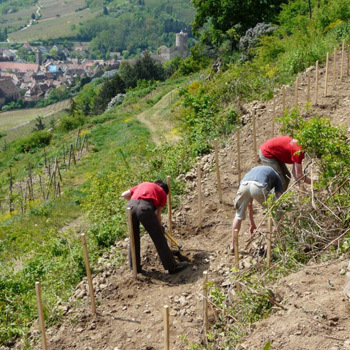 It is planted on the estate in the soils of Ritterpfed at Zellenberg and the Sonnenglanz great vintage at Beblenheim. These full bodied, well structured wines are creamy and have a powerful spicy floral aroma. My parents like serving these wines “to keep” par excellence with foie gras (from Alsace), fairly spicy food or delicious apple desserts. Finally, let us look at a distant Burgundy cousin.